In this article I will describe the second component of the CMS option in SilverFast Ai and SilverFast Ai Studio. 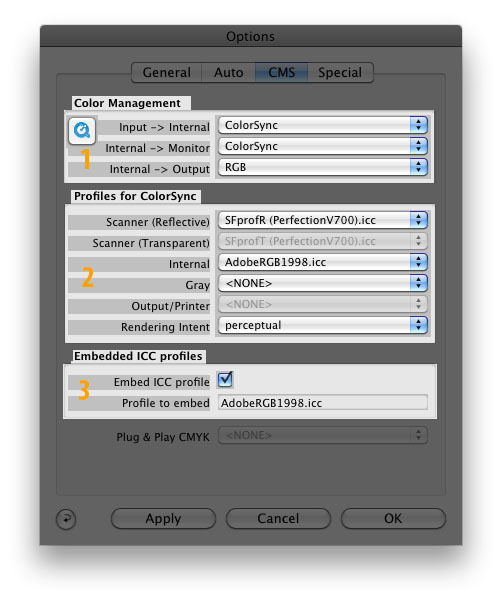 The second section “Profiles for ColorSync” (on Mac) or “Profiles for ICM” (on Win) has six sub-menus to assign specific color profiles to every device and process. Scanner (Reflective) assigns the color profile for the scanner when scanning reflective material. Scanner (Transparent) assign the color profile for the scanner when scanning reflective material positive or Kodachromes. Note that this menu is greyed out because the scanner was set to ‘reflective’ before opening the options dialogue, if you wish to adjust this menu, please make sure you activate the transparency scan mode before. * These profiles (Reflective and transparent) are scanner model specific and come with a generic profile for every scanner model. Specific profiles for your own scanner can be generated using the IT8 calibration tool (optional and sold separately). Windows might present problems with more than 200 color profiles, should you have more than 200 color profiles, make a back up of your profiles and use only those you need. No scanner profile is provided for negative scans in CMS, the scanner profiles for negative scans are provided with the tool NegaFix where every film type can be selected. Internal assigns the basic color space on which the entire scanning process will work. This is also the profile that will be embedded within the resulting file (in case that option is active). Output/Printer assigns the printer profile. To activate this menu, the option “ColorSync” (Mac) or “ICM” (win) under the menu “input->Output” in the firs section should be selected, otherwise this menu will be inactive. When this profile is assigned the resulting file will be generated in RGB by the scanner and then converted to the selected profile. Rendering intent tells SilverFast how colors from one system should be interpreted in another system or from one device to the next one. Since every device sees and interpret colors in different ways, there should be a system that tells SilverFast how to interpret all colors from one device and convert it to another device or color space. (This categories will not be explained in depth in this article).